Jamaica! The name alone calls to mind a place where life seems like an endless day on a Caribbean beach. But let’s face it, not everyone can fly there on a whim. So why not plan a Caribbean themed engagement party using the beauty of Jamaica as your inspiration? We’re not talking about a grand production at a hotel or fancy restaurant. 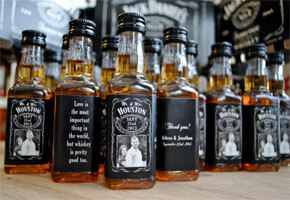 Instead, this is for an “at-home party”—the trendy, new way to mark a special occasion. Here, the guest list includes just your closest friends and family. Plus, the event is friendly on your budget, since you have total control of every detail. 1. 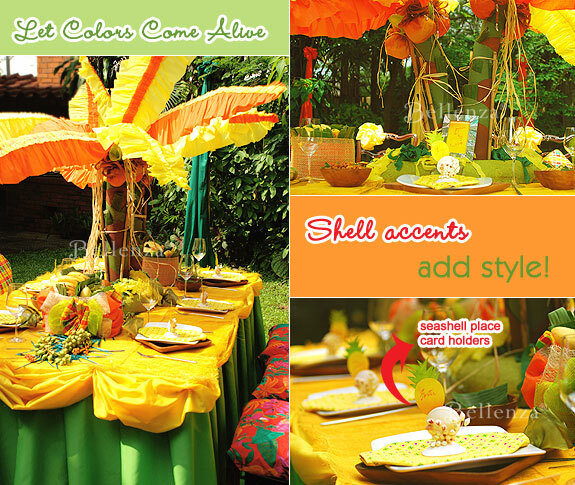 Go Crazy With Color for a Jamaican Party! We’re just in love with the idea of recreating the look of a Jamaican plantation—complete with coconut trees and pineapple fields. Bold colors are everywhere. Vibrant golden yellow dominates the scene and casts that sunny Jamaican glow over it all. Bright orange and green serve as vivid accents. Neutral brown, beige, and tan provide tempering touches. Delight your guests with table décor that’s nothing short of fun and festive. And for real impact, anchor it on centerpieces that truly get that Jamaican vibe across. Craft a towering coconut tree centerpiece from yellow and orange crepe paper. Imagine simulating picnic-style dining in a coconut grove, right in your own backyard! Use fresh tropical fruits to create centerpieces as well. Fill wooden bowls or woven trays with bananas, mangoes, guavas, and pineapples—or whatever tropical fruits are available at your local farmers’ market. 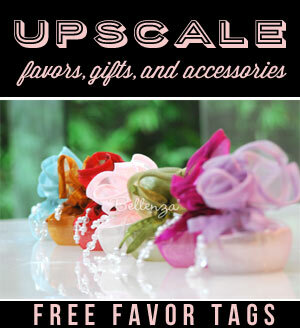 This is a great way to add color and texture to your table display without spending a bunch. For equally colorful centerpieces, try simple floral arrangements in low glass or bamboo bowls, with flowers such as hibiscus, plumerias, and birds of paradise. You don’t have to use a lot of these blooms. Just a few will go a long way when you combine them with other elements such as fruits, stones, or shell accents. 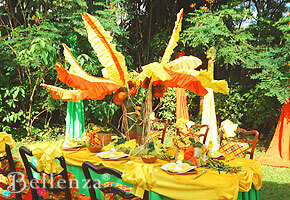 To get more table decorating ideas, read “3 Truly Tropical Table Ideas for a Caribbean-style Wedding Celebration“. Jamaican cuisine is known for its spicy flavors and its multi-ethnic influences—ranging from British to East Indian to even Spanish fare. Make it a fun Jamaican BBQ – Since this is an at-home engagement party, why not put on a fun barbecue with a guest “grill master” cooking up the famed Jamaican Jerk Chicken? Imagine the aroma of barbecuing filling the air! To keep costs down, you can buy the ingredients for Jamaican cuisine from an ethnic grocery near you. Or you may opt for the zero-hassle approach and have a restaurant cater an all-grill menu. For more menu ideas, check out our Caribbean appetizer’s post. Serve tasty side dishes – For accompaniments, serve crunchy grilled vegetables with traditional Jamaican side dishes, such as fried plantains, Johnny cakes, rice and peas, and festival (fried cornbread). Indulge in exotic desserts – To end the meal on a sweet note, offer desserts like mango ice cream, rum raisin cake, and fried banana fritters. 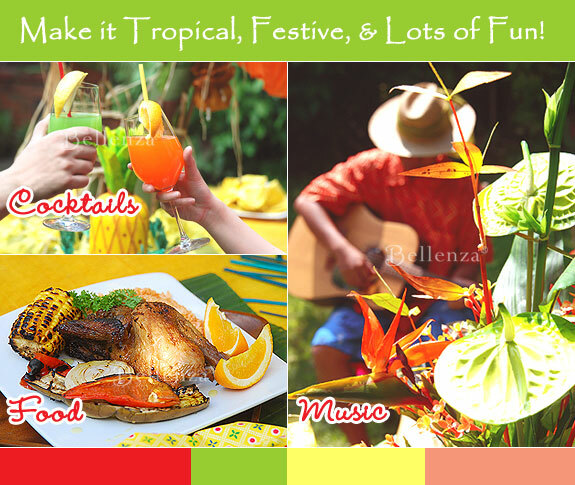 With such a festive atmosphere for your party, the rhythmic sounds of steel drums and maracas must be in the air. Beating time to reggae music, of course! 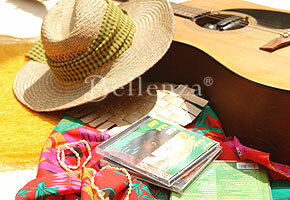 Play your favorite reggae CDs to get the party going. Think Bob Marley, UB40, and other popular artists. Got any friends or relatives who play musical instruments? Have them show off their skills by playing along. Have simple percussion instruments on hand, so even your non-musical guests can get in on the fun. And what would a fun-filled Caribbean party be without the limbo dance? So limber up and get ready to show off those dancing skills! Throw a Fondue Party! 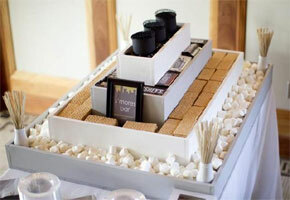 Ideas to WOW your guests! all i can say is…. that’s absolutely fantastic! the chicken looks so yummy! I love the centerpieces you have pictured for the jamaican theme!!! Is there anywhere I can look it up/buy the “how to make them”? Great question. To make them, you will need crepe paper (various colors), cardboard, styrofoam, various sizes of craft wire, glue, and scissors. The centerpiece itself was made of a cardboard stand that is nestled on a styrofoam base and then the leaves of the tree were made with pleated crepe paper of different colors. Good luck! I love the banana tree centerpiece, but I need more detailed instructions on how to make it. I can’t enlarge the picture enough to see the base or trunk. Is the cardboard stand cut in the shape of a trunk and stuck into a slit in the styrofoam? Stay tuned! In the future, we plan to publish an article on how to go about creating the banana tree centerpiece. Just to let you know, we also used floral foam to hold the base of the tree, in addition to a styrofoam base. As for the tree trunk, the stand is covered with card board. Thank you! Hello Sherry. It’s great that you are having a Jamaican themed party! Moreover, we’re planning to release the article sometime this year but not in March. As for the table cloth, it is actually a very large sheet of fabric that we used. You may want to try stores like Bed Bath & Beyond or JoAnn Fabrics for some similar looking tablecloth. 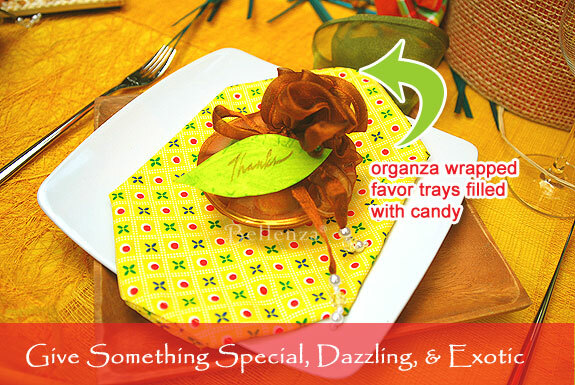 Some discount party supply shops might also carry them in tropical themed designs. Have fun! LOVE this idea for a jamaica party. Please hurry with the tree instructions. I am hosting a rehearsal dinner for my son and this is what I have been looking for. The wedding is in June. What did you use to swag the tablecloth? For the swag table cloth, we just used some cotton fabric larger than the tabletop size. And then, we bunched up the excess cloth in several parts and secured them with pins. It’s that easy! Hi, when you bring out instructions on how to make tbose magnificent palm trees, could you please contact me? I am planning a 30th birthday party for my future husband, which everyone thinks is a surprise birthday party, but its actually a surprise wedding… Those palm trees look like they’ll take the cake! Hi guys! I will be having a Caribbean themed wedding in August and absolutely LOVE your colorful Caribbean table settings. Do you know where I can purchase some of the items used in the pics? Hello Sheryl! We’ve crafted an article on how to make the tree centerpiece. It’s been such a popular inquiry, so here it is. Please read From the Tropics to Your Tabletop: A Coconut Tree Centerpiece! I love pie! This looks very good. Thank you for the ideas! Wilhelmina, how waw your party? What did you use as tableclothes? Having a hard time finding durable material. We are having a field bbq Engagement party for my daughter and her fiance in July 2011 with the Jamaican theme…it will be pot luck so hopefully the food will be various Jamaican recipes….one thing we are going to surprise them with….rasta hats with the dreds attached…I think it will be only fitting that the bridal couple wear it throughout the evening!!! Because it will be on a very large scale, an open party, we love the coloured table cloths and jamaican music….Several musicians will be in attendance so I am gathering my maraccas, spoons and pots and pans as suggested…….thanks so much for all your suggestions….It will be a BYOB but to have a jug of Jamaican Rum is perfect! !